Over the past fourteen weeks, we have been guests of three Asian cities: Singapore, and Kuala Lumpur and Ipoh, both in Malaysia. Each city has its own unique way of making visitors feel welcome, even as we notice things different from home. Singapore, a city-state of about six million, offers a top-notch public transit system. Bus or rail; underground, above ground, or at ground level – you can get where you want in a timely manner and on time. For the past 30+ years, my husband and I have called the Northeast US home. Some have said that the metro area from Boston to Washington, DC, is one huge megalopolis of over 50 million residents. Even with all those people it can be quite a challenge to get from city to city without a car – not all areas are served reliably with public transit. But in Singapore, we can get wherever we need to conveniently and comfortably without a car. Do remember: the public transit system does shut down over night so make sure it is still running if you like “going out on the town.” Thank you, Singapore, for welcoming us with a friendly, clean, and dependable public transit system! 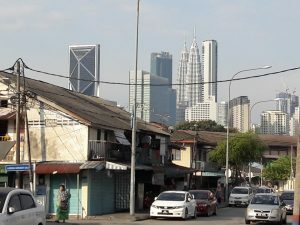 Kuala Lumpur, the capital of Malaysia, is a city of less than two million. It is a city growing and expanding, where modern fast-paced life meets the slower rhythm of small town life. 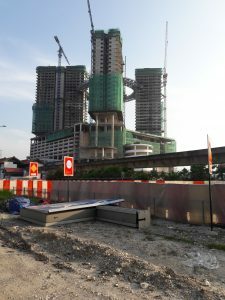 Where we stayed, KL is a city “bursting at the seams” with traffic jams overwhelming crowded roads under construction. One Saturday morning we wanted to a find a produce market for some fresh fruits so we decided to explore (ah, yes, you remember how we like to explore on Saturday mornings!). We hit an unexpected snag when we realized there really was TOO much traffic for us to be able to cross the road safely, even by putting aside our American views of what safety looks like. We were stumped. How would we cross? The view from the other side of the road! Just then, a man appeared wearing a brightly-colored vest and a hard hat. Waving his battery-operated wand, he boldly walked directly into traffic, blew his whistle, and demanded that the never-ending line of cars stop. He told us to cross. Never had we faced such traffic conditions before. Never had we imagined that a construction company would hire a worker so pedestrians could cross the road. 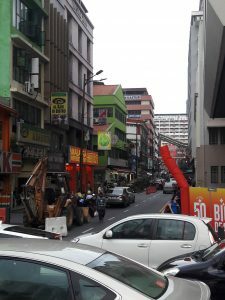 Thank you, KL, for caring for the safety of pedestrians – local and foreign! 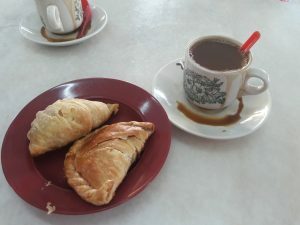 Kaya puff and curry puff meet Ipoh coffee. Ipoh, the smallest city we’ve stayed in, has about 660,000 residents. It is the hometown of Au and his father still lives here. Ipoh is a city of culinary delights and known for particular dishes. Tourists from out of country even come here to sample hor fun, bean sprouts, braised chicken feet, and Old Town White Coffee. Au loves the curry noodles and my current hobby is tasting the many ways locals like to make kaya puff and curry puff. We love the food, but we ponder again and again the many ways extended family has welcomed us into their lives and routines. It is especially meaningful as we are here for Chinese New Year when family ties are strengthened. We are all looking forward to the family reunion dinner on Monday night. Thank you, Au family, for welcoming us into your lives in Ipoh! 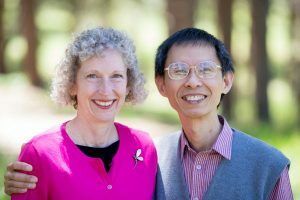 We are thankful for new insights on what it means to be a guest here in Asia. I have only been to one of those 3 cities. Makes me want to visit the other two. Wonderful reminders on how to be a good guest. And since then we’ve been to visit another city, new to us. It is a good lesson to learn about being a good guest even amidst the challenges of feeling like a wandering nomad. Thanks for your reply! Thank you for replying! Your prayers are appreciated. The city has grown quite a bit and yet still has some of the favorite dishes of yesterday.